The launch of a next-generation ship naturally draws a comparison against the pioneer of high-tech cruising. Some of the aspects on MSC Meraviglia, christened by Sophia Loren in Le Havre, resemble those found on Quantum class of ships from American giant, Royal Caribbean. 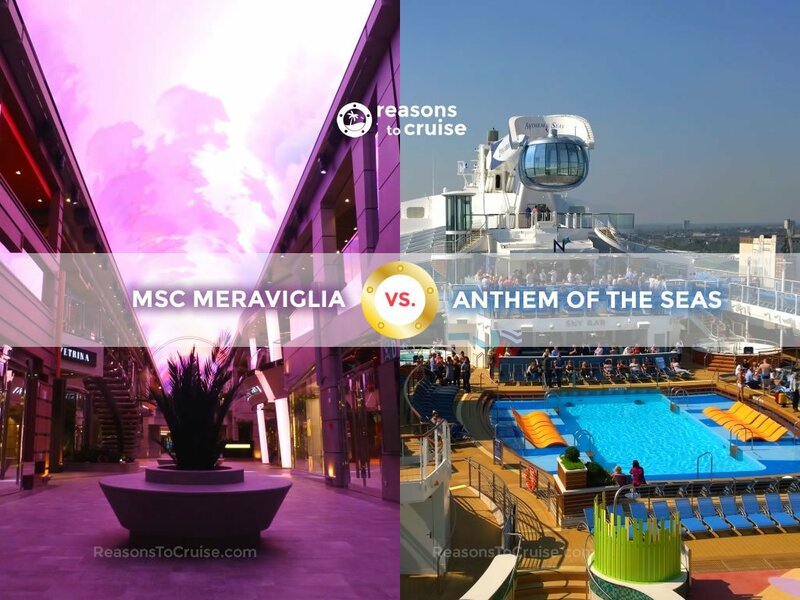 MSC Meraviglia vs. Anthem of the Seas: Which is Best? As Quantum of the Seas and Ovation of the Seas are in Asia, I have compared Anthem of the Seas (sailing out of New York to the Caribbean, Bermuda, and the Bahamas) with MSC Meraviglia (sailing out of Barcelona, Marseilles, and Civitavecchia around the Western Mediterranean). The differences in the data above are negligible. Both ships have similar gross tonnage although Anthem of the Seas measures longer and wider, with two additional passenger decks. MSC Meraviglia has greater passenger capacity both regarding double occupancy (two people sharing each cabin on the ship) and full capacity (passengers occupying every single bed). MSC Meraviglia has the potential to be the busier ship thanks to greater guest numbers, but I would say they both feel similar in that respect. 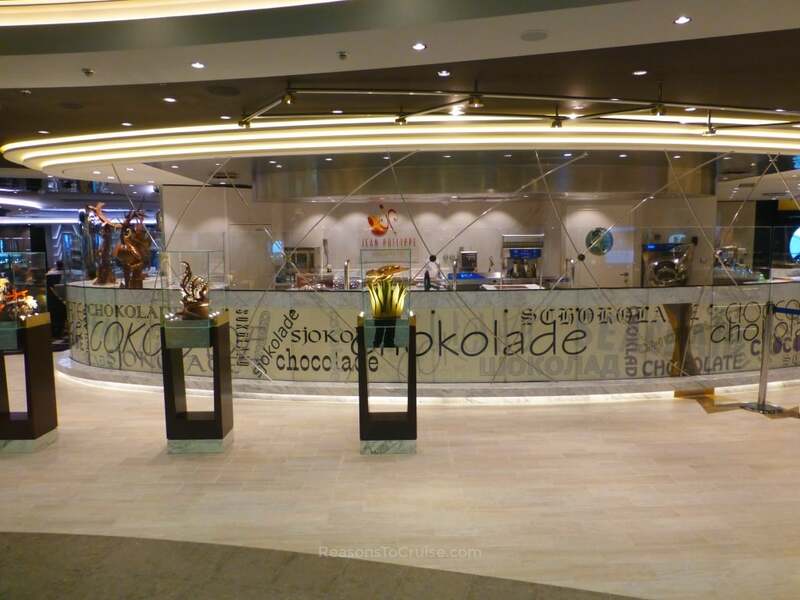 It is worthwhile noting that both cruise lines employ creative interior design to make some of the public areas, like lobbies, feel more spacious. 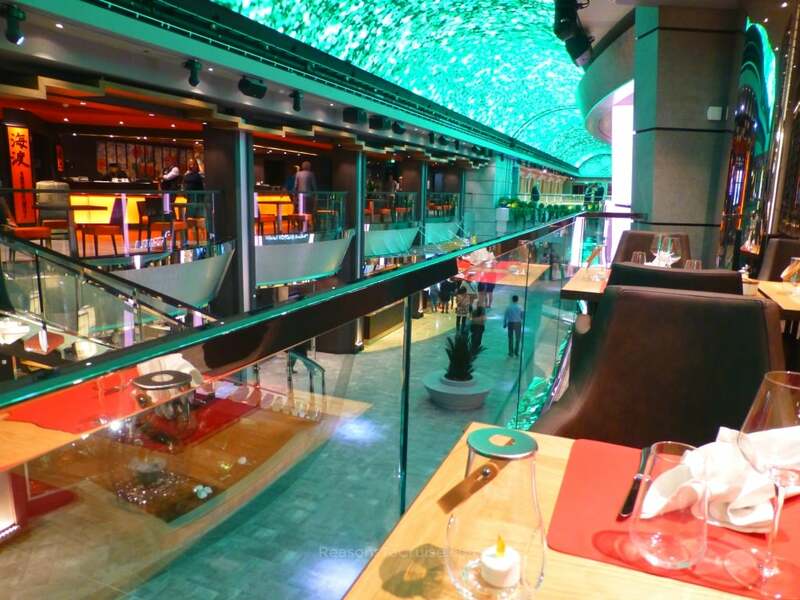 Pastel and neutral shades, the smart use of lighting, and in the case of MSC Meraviglia, an extensive use of mirrors, paints the illusion of roomier vessels. Who wins? It is a draw. While Anthem of the Seas is a longer and wider ship with more passenger decks, MSC Meraviglia boasts the greater gross tonnage and passenger capacity. Now it is time to look at the other common factors shared by the two ships. 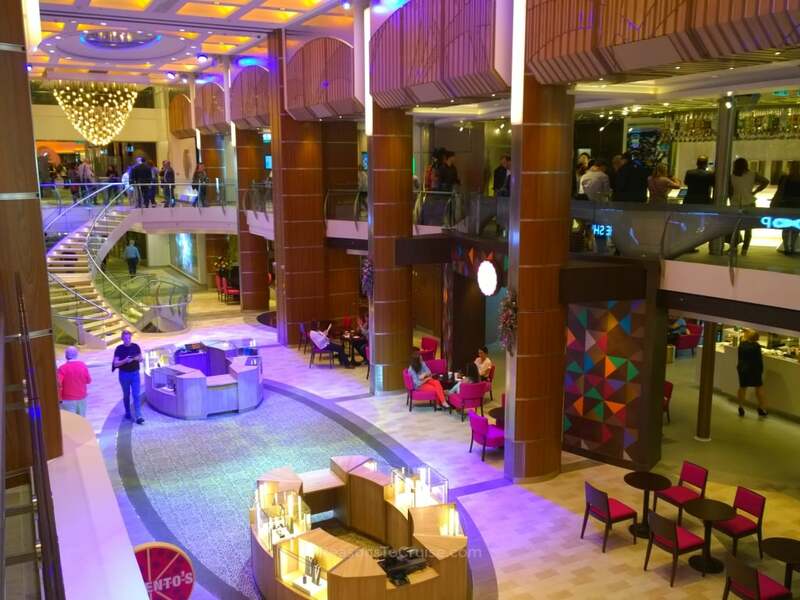 Royal Caribbean turned its Royal Promenade concept on its head by shrinking the length and doubling the height. Royal Esplanade was born and is home to high-end boutiques, a logo shop, a café, a patisserie, a bar, Guest Services, a pub, a pizzeria, as well as Japanese and gastronomic concept restaurants. 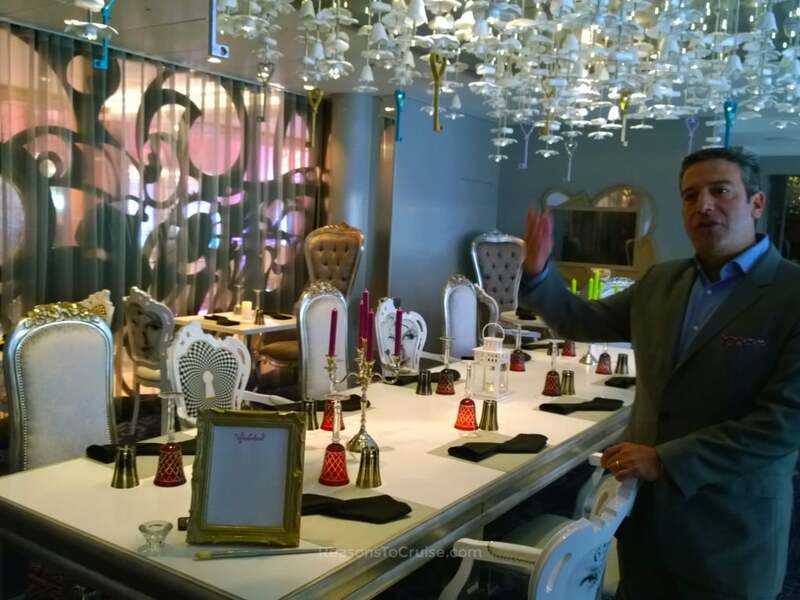 The cruise line's quirky Bionic Bar by Makr Shakr also lives on the upper level, serving scientifically mixed cocktails albeit at a snail's pace. The effects are of mixed quality, with some better than others. The quality of artistry and animation is sometimes not as fantastic as it could be, but the concept is certainly spot-on. Who wins? MSC Meraviglia. 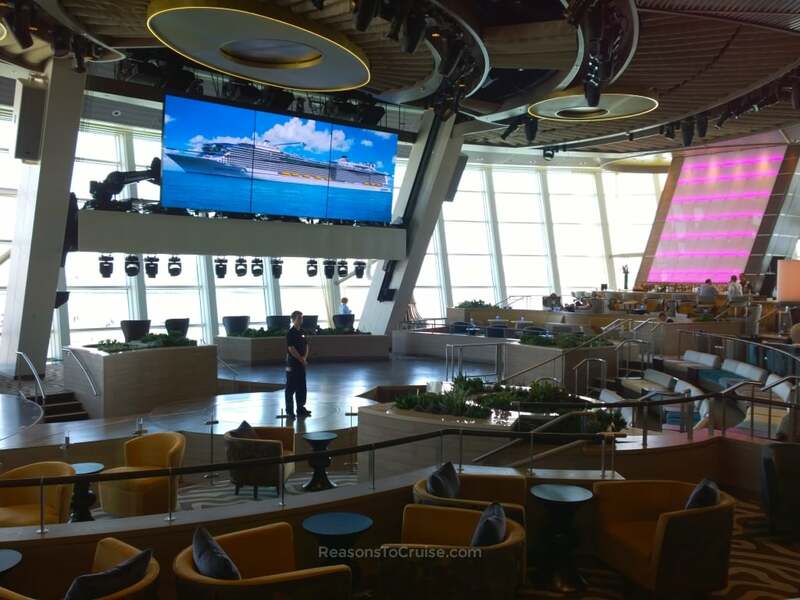 While Quantum class introduced a two-storey shopping and dining space, MSC Meraviglia has the edge with that LED screen, although the animations are not always mind-blowing. I would love to see what Royal Caribbean could do with the technology should they choose to install something similar on their next Quantum class ship. When Royal Caribbean said it was going to use robots in its shows, the world sighed. But Spectra's Cabaret is a masterpiece. 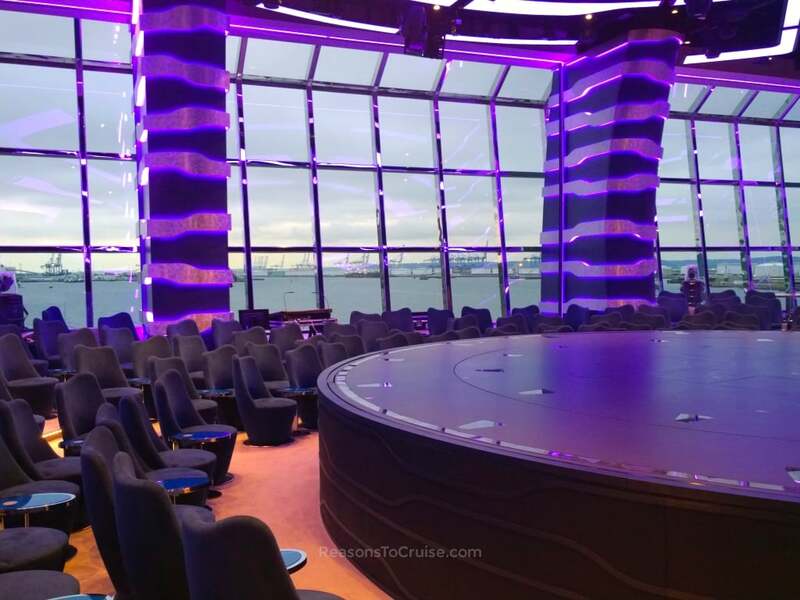 The panoramic windows of the Two70 Lounge become projector screens, immersing the audience in a wrap-around show. The effect further enhances with robotic screens that jostle around and choreography that see the performers take the show from the centre stage into the audience. 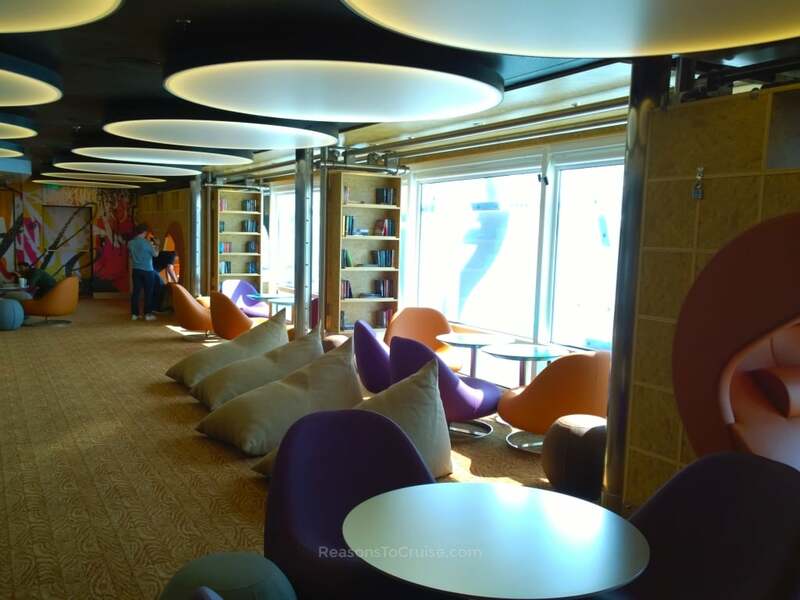 The smaller MSC Cruises venue, the Carousel Lounge, is broadly similar in style. However, the cruise line turned to Cirque du Soleil to produce its shows for this space, undoubtedly making this enterprise successful in an instant. The only disappointment is the introduction of a fee levied on tickets which are only available bundled with dinner or a cocktail. Who wins? Anthem of the Seas. MSC Cruises' partnership with Cirque du Soleil is a coup, but the cinematography, staging, and robotic screens used in the Spectra's Cabaret shows in Two70 is incredible - and Royal Caribbean's offering is free to all. 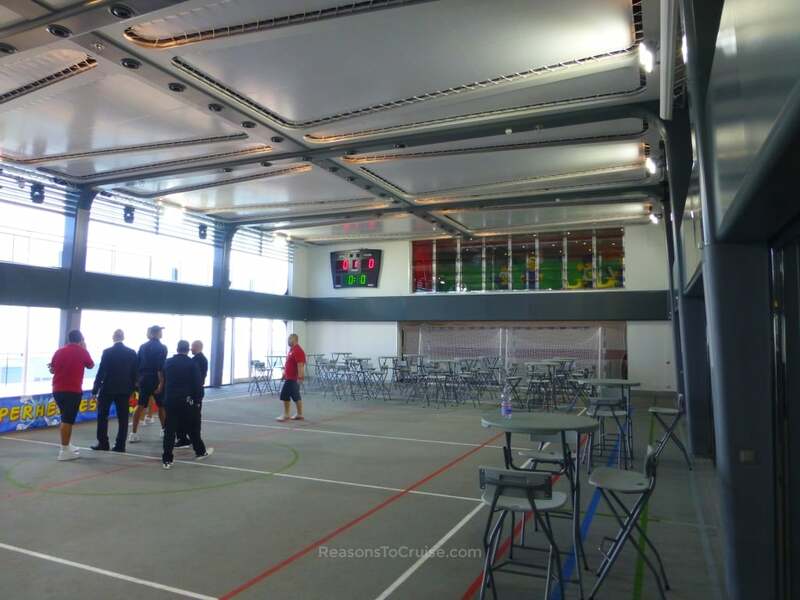 Royal Caribbean's flexible indoor sports space has a trick up its sleeve. Yes, it can be a football pitch one moment and a basketball court the next. Yes, it becomes an entertainment venue for parties and games shows late in the evening, but its party trick is a fleet of dodgems. You read that right - bumper cars at sea! This space has it all - even a hot dog food truck too. MSC Cruises' similarly named space is equally versatile, with options including a sports court and a party venue. I look forward to seeing how MSC Cruises maximises use of this space. Who wins? Anthem of the Seas. One word - dodgems. 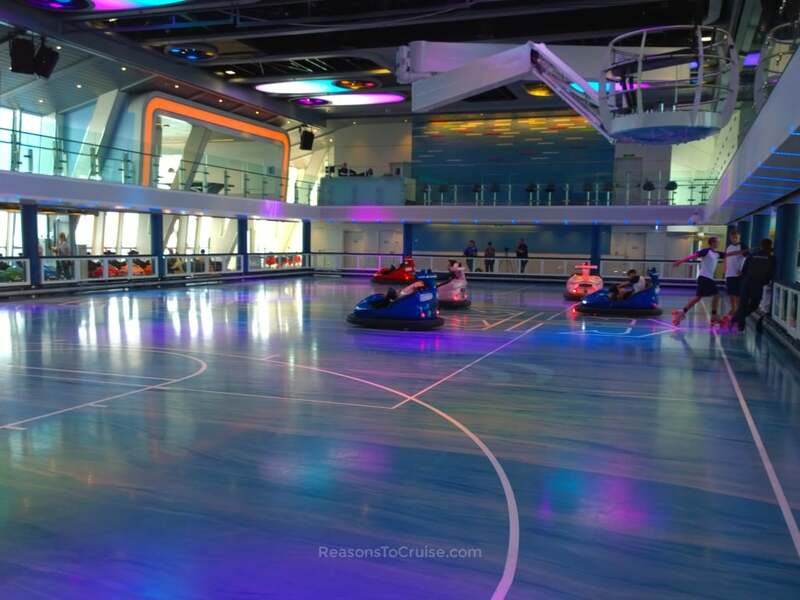 The spaces on both ships are as versatile as each other, but Royal Caribbean's edge with bumper cars makes their interpretation a little more exciting. Adventure Ocean, Royal Caribbean's children's club, is usually well rated by kids and parents alike. The rooms for each of the age groups are quite subdued on Anthem of the Seas. The clubs run throughout the day and into the evening. Teens have a separate chillout area. 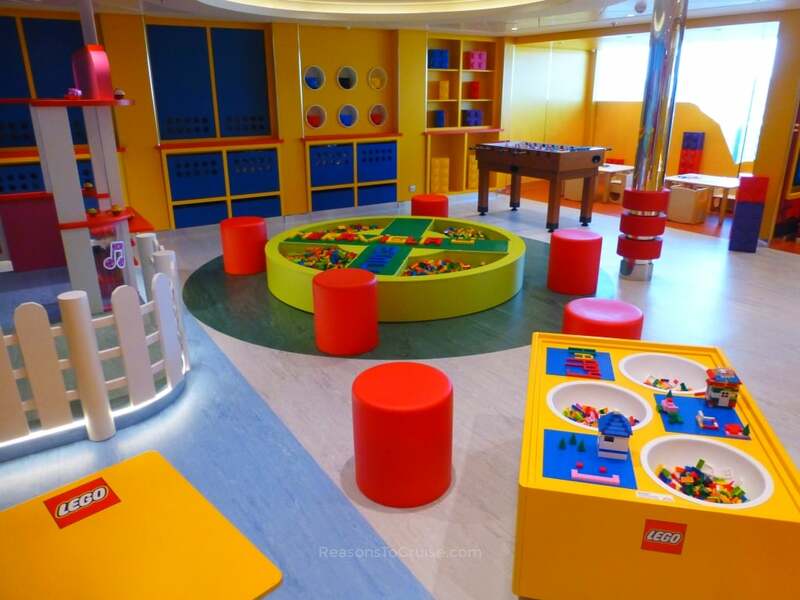 The kids' clubs at Doremiland on MSC Cruises' MSC Meraviglia have been built from the ground up around the Chicco and LEGO brands for the different age groups. Children aged three to 11 can immerse themselves in a world of LEGO. Older kids benefit from games consoles and a nifty interactive digital table. Better still, the opening hours are now morning to night, rather than blocks of time here and there as I have previously experienced. The brand partnership does not end there. LEGO MSC Meraviglia models are available to purchase in the shop for around €11.50 (&thickapprox; £10) a box. I defy any parent not to pick one of these limited availability sets up for their child as a souvenir. Who wins? MSC Meraviglia. This ship is the first new-build since MSC Cruises partnered with The LEGO Group and Chicco, and the club rooms have been built from the ground-up, embracing both brands. Adventure Ocean consistently receives rave reviews and only time will tell if MSC Cruises' new Doremiland can net the same results. One of the best innovations from Royal Caribbean are the loft suites. These luxurious dual-storey cabins are the thing of dreams. For a cruise to remember, there is no better choice of room in my opinion. 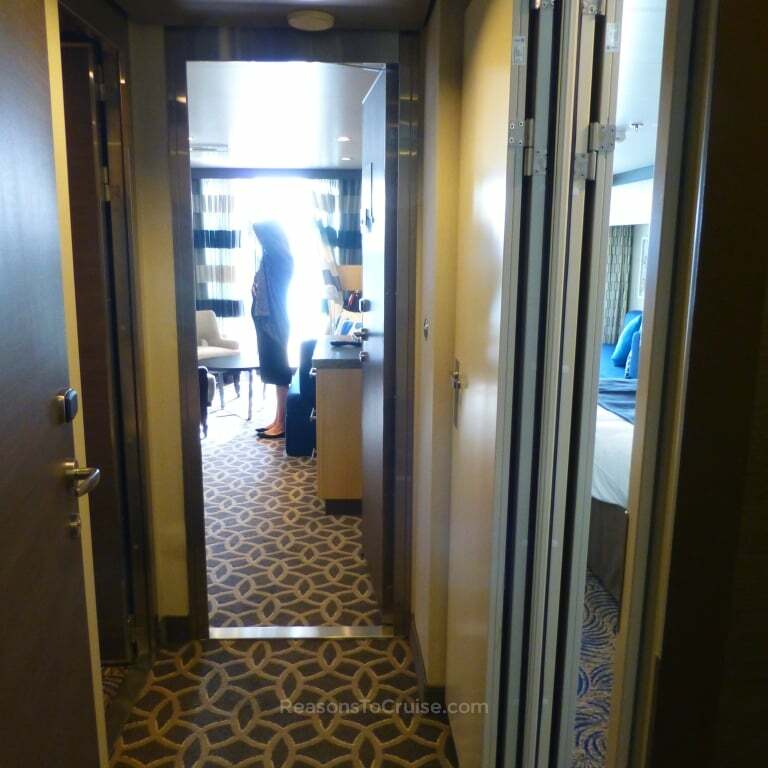 Anthem of the Seas has a selection of loft suites in various sizes and budgets. 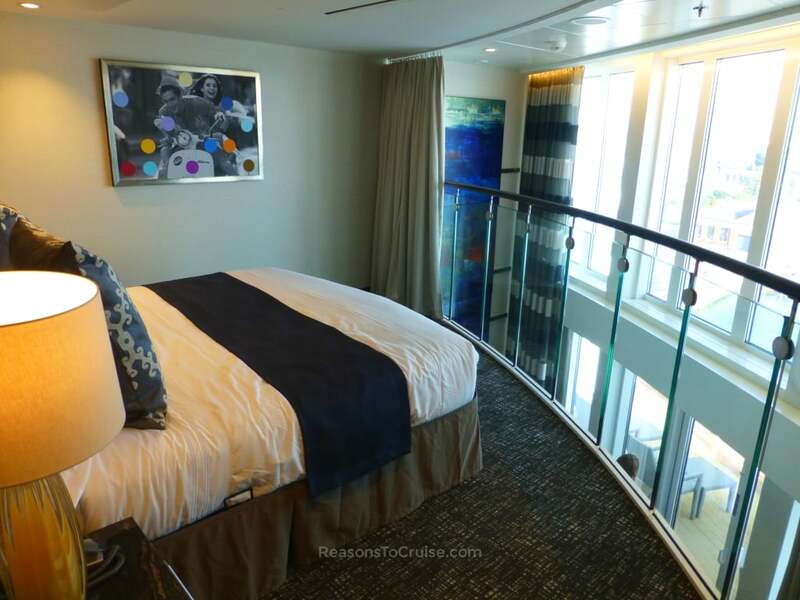 The Sky Loft Suite bears most resemblance to MSC Meraviglia's Duplex Suite. Muted browns and greys dominate the décor, while the two-storey wall of glazing floods the suite with plenty of light. The upper mezzanine level fits a double bed with a fold-down TV mounted at the foot. Walk-in wardrobe space sits behind, as does an en-suite shower room. Downstairs, a dining table and lounge sit opposite a large wall-mounted television, with a second en-suite shower room next to the cabin door. Loungers, chairs, and a table sit on the spacious balcony. MSC Cruises' interpretation of a luxury two-storey pad is broadly similar, with some small differences. The results lack the elegant styling used elsewhere on the ship, particularly in the choice of furnishings. Upstairs is a double bed with an en-suite bathroom (with a shower-over-bath setup) and a wall-mounted television. Downstairs is a dining table and lounge opposite a desk and large wall-mounted TV. A downstairs shower room adds another toilet to the cabin. The pièce de résistance on MSC Meraviglia is the outdoor hot tub on the glass-fronted balcony with views to rival the captain's perspective. Who wins? It is a draw. Anthem of the Seas has the smarter looking suite, but lacks the outdoor hot tub. MSC Meraviglia's Duplex suite has the hot tub but a lower quality of furnishings I would expect to see given the price tag. It also has envious views directly out of the front of the ship and the tall balcony glazing should help to deflect sea breezes. On Royal Caribbean, connected cabins are nothing new, and have been used by families for years as a way to have shared and individual spaces throughout a cruise. Family Connected cabins on Anthem of the Seas collect a trio of cabins together into one space. A Junior Suite, a Studio cabin and an Ocean View balcony cabin combine to form an expanded area ideal for larger families. It can accommodate up to 10 people. MSC Cruises' MSC Meraviglia boasts a variety of connected options, joining up to three cabins to achieve a similar effect. The largest combines two balcony staterooms with one interior stateroom to accommodate up to 10 people. The combined space offers two balconies and three bathrooms. Who wins? It is a draw. Both ships achieve near identical results in near identical fashion. These versatile interconnecting cabins can make life much easier for larger families that want to travel together. Royal Caribbean has had a turbulent time with its dining after its Dynamic Dining flexible programme flopped. The ship now uses a form of traditional dining, although the lack of a central dining room means the sensation of dining in a three-storey room does not exist. Instead, there is a concerted effort to offer more dining choice, albeit at a cost. Celebrity chef Jamie Oliver headlines the list of premium venues with Jamie's Italian at sea. James Beard Award-winning chef Michael Schwartz is behind Michael's Genuine Pub, with premium bar snacks available. Wonderland pushes the boundaries of gastronomy with very creative ideas to test your palate. Steakhouse Chops Grille, Izumi Japanese restaurant, and American diner Johnny Rockets round off the headline options. On MSC Cruises' MSC Meraviglia, Jean-Philippe Maury is the pâtissier behind the chocolate and ice cream shop. The cruise line's partnership with Eataly continues too. The Butcher's Cut steakhouse and Kaito Teppanyaki Restaurant & Sushi Bar will rival options on Anthem of the Seas. Who wins? It is a draw. Royal Caribbean opts for a mix of branded speciality outlets including Jamie Oliver's restaurant and Johnny Rocket's 50's style diner, plus own-brand favourites. MSC Cruises recruits Jean-Philippe Maury for the chocolate shop and Eataly for superior Italian cuisine, with a mix of own-brand options. 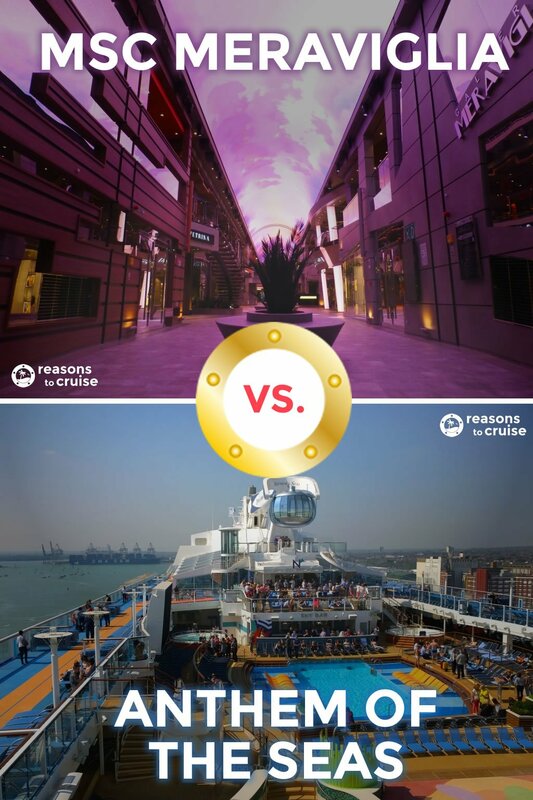 While comparing the features makes a lot of sense, comparing the cruise fares also helps put things into perspective. Creating a like-for-like comparison is impossible, as the two ships sail vastly different itineraries. However, I have found cruise-only fares for seven-night itineraries on the same sail date 18 months in advance, to give an indication of how the fares differ. I generated quotes based on two sharing a cabin and have listed the prices as per person. The results are listed below purely for reference. Prices are for the lowest grade of cabin in each category. Disclaimer: Prices fluctuate faster than the wind changes direction, so it goes without saying that these are just a snapshot for reference. Your circumstances and preferred sail date may result in a higher or lower cost. To find out what the fares are today, click here for Royal Caribbean° and here for MSC Cruises. While both ships share commonality as you can see above, they each have unique features too. Both ships have commonalities too. Both are all-weather next-generation ships, comfortable sailing in the cooler European climate as well as hotter climates like the Caribbean. Both make use of wristbands and apps, a pub, a casino, a theatre used for live shows and entertainers, and a spa with a fitness area. The pair also have fast WiFi available capable of sharing selfies and more. In the sections above, both score equally as good as each other. The cruise fare data above hints at lower pricing on MSC Meraviglia overall, but without identical itineraries to compare, this can only be an assumption. Although both ships share similar traits in certain places, the two vessels are very different. MSC Cruises opt for an Italian approach to décor, style and service. Meanwhile, Anthem of the Seas boasts high-tech innovations alongside Royal Caribbean's world-class entertainment and can-do American service. Both ships offer a good all-round experience for families. MSC Cruises focuses its attention on several standout features, value for money, and its itineraries that cram in ports of call like there is no tomorrow. Royal Caribbean focuses its attention on creating headline-grabbing entertainment options even though it might cost more. Both ships offer a premium experience too should you wish to part with more of your money. Book into a suite for that luxury feel. On MSC Cruises, check into a Yacht Club cabin for access to a quieter members-only area on the ship. Add a drinks package to your cruise to turn it all-inclusive. Book into speciality restaurants to experience exquisite food, service, and table-side entertainment. Be aware that while the original cruise fare may appear cheap, you will need to spend more on board to elevate your holiday from 'standard' to 'unforgettable'. Which ship would I ultimately recommend? I do not think there is a clear winner here. There is overlap in the services and amenities onboard, and also aspects exclusive to each ship. In the Caribbean sunshine, it is all about fun, and the American-style cruise experience on Anthem of the Seas is perfect for that. The entertainment options on the ship mean you can do as much or as little onboard, while the chilled ports of call mean you can head straight to the beach or enjoy some sightseeing on land. Conversely, if you plan to explore the Mediterranean, why would you not do this on a Mediterranean cruise ship? MSC Meraviglia is a floating slice of Italian culture and lifestyle, and this glamorous ship is a great place to come back to each night after exploring Europe's historic sites on a port intensive itinerary. The flagship in the MSC Cruises fleet, MSC Meraviglia combines stylish décor, some standout entertainment options, and good value cruise fares. Which ship do you think is best? Does the Italian masterpiece outrank the high-tech American showpiece? Leave a comment below with your favourite. Disclosure: I have toured both MSC Meraviglia and Anthem of the Seas with help from MSC Cruises and Royal Caribbean respectively. My opinions are my own. My wife and I sailed on Anthem of the seas from Southampton to the Canaries in June 2015 and we did Ovation if the seas from Dubai to Singapore in May 2016, we then thought we would give MSC Meraviglia a try last September 2017 around Italy, Spain and Malta !! Never again, there is no comparison between the two cruise lines, Meraviglia as a very nice ship and the service was ok, but the food and entertainment were terrible. Anthem and Ovation on the other hand are my favourite ships, better in our opinion even than Oasis which we also loved incidently, the food choices, the entertainment, the things on board to do, the service all far exceeded Meraviglia hands down. MSC have a long long way to go to get anywhere near Royal Caribbean and we won’t be cruising with them again anytime soon. Looking forward to 11 days around the Caribean on our first Celebrity Cruise on Reflection in November. Thanks for sharing. The offering from both companies does differ is several key areas, but MSC has come on leaps and bounds in recent years. The key for MSC is it’s value for money proposition, although I think it’s Aurea and Yacht Club cabins are where the best value lies. There’s no way I could have afforded Royal Caribbean’s version of this suite for instance. In my opinion, Royal currently outranks MSC in terms of service, non-Italian food, and entertainment, and MSC outranks Royal in terms of pricing and value for money. I’d love to know what you make of Celebrity compared to Royal Caribbean. From what I’ve seen, it’s a foodies paradise! I was in Rccl Anthem of the sea during 2015. The dining choice in Anthem of the sea are more , the food & presentation are good . The shop is Modern & Cyber . No too crowd. I think MSC are certainly upping their game. I’m heading back on the ship soon, and am interested to see what it’s like on a normal sailing. Please let me know your thoughts after your September cruise.